JAKARTA, Jan 29, 2015 - (ACN Newswire) - On Tuesday, January 27, 2015, Skytrax CEO Edward Plaisted presented PT Garuda Indonesia (Persero) Tbk. with the "5-star Airline" award which was received by Garuda Indonesia President & CEO, M. Arif Wibowo. Also attending the ceremony was the Minister of Communication of the Republic of Indonesia, Ignasius Jonan, at Hotel Indonesia Kempinski, Jakarta. 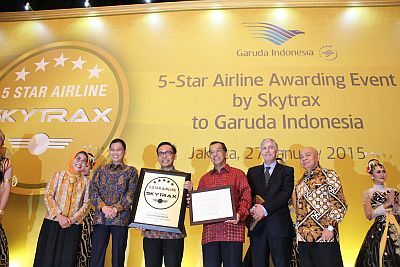 Previously, on December 11, 2014, Skytrax in their webste, officially announced Garuda's eligibility to become a 5-Star airline following an audit they had conducted. Skytrax is the world's leading airline and airport review specialist headquartered in London. This prestigious recognition is testament of the many improvements consistently carried out by the company over the years that eventually led to its transformation from a little known entity among the world's airlines into one of the best airlines with a top-tier 5-star ranking. Of the 200 and more airlines in the world today, only seven are named a 5-star airline, namely Singapore Airlines, Cathay Pacific Airways, Qatar Airways, Asiana Airlines, All Nippon Airways (ANA), Hainan Airlines and Garuda Indonesia. Indonesia Minister of Transportation, Ignasius Jonan said that becoming a 5-star airline is an impressive achievement that not only improves the airline's reputation but also that of Indonesia in the eyes of the world. "This is indeed something exceptional. I believe that Garuda's gift to the Indonesian people is the fruit of hard work, determination and consistent performance of the management and all Garuda Indonesia employees, to deliver the highest standard of service to their customers, and which eventually resulted in Garuda's success in becoming a 5-star airline," added Jonan. CEO Skytrax Edward Plaisted explained that the 5-star airline rating is a firm recognition of Garuda Indonesia's ongoing transformation in terms of the standard and quality of its services. "This achievement reflects the hard work by the airline in recent years and we are delighted to confirm that they have met the standards of a 5-star airline," said Plaisted. "Consistency of an airline's product and service is a major part of the 5-Star rating, and Garuda's fleet now offers Business Class flat-bed seating and 32-34 inch seat pitch in Economy Class. Customers can also experience the new First and Business Class 5-Star service concept in their newest Boeing 777-300ER fleet," added Plaisted. Furthermore, Edward also added, "We place a lot of importance on the fact that the majority of customers travel in Economy Class. It is the quality and consistency of those standards that contribute greatly to Garuda becoming a 5-star airline." Garuda Indonesia President CEO, M. Arif Wibowo said this achievement marks another important milestone for Garuda Indonesia as it is testament of the world's recognition of Garuda Indonesia's ongoing transformation program and improvements. "We are proud to present this award to the people of Indonesia. We shall remain committed to improve even better and hold our 5-star airline title, and of course to always provide service of the highest quality to all Garuda Indonesia customers," added Arif. Arif added, "We are truly honored to receive this prestigious award, so at this opportune moment, on behalf of Garuda Indonesia, I would like to thank all of Garuda Indonesia's stakeholders, including all of our valued customers. Nevertheless, being recognized as a 5-Star Airline has ignited us even further and inspired us to challenge ourselves to improve even further and provide the best possible services for our passengers, consistently and continuously. "Garuda's success in becoming a 5-star airline is the result of continued dedication, commitment and hard work from all Garuda Indonesia employees to deliver the best possible service to its customers. We also gratefully acknowledge the support provided by our customers which led to Garuda Indonesia being awarded this prestigious 5-star airline award," Arif added. An airline's rating is based on an overall evaluation of Garuda's products and services, both in its ground service at the airport and the delivery quality of inflight service onboard Garuda's flights. Becoming a 5-star airline ultimately affects Garuda Indonesia's improvement plans for 2015, such as moving operations to Terminal 3 Soekarno-Hatta International Airport, which is the airline's home-base hub. The new location will offer Garuda Indonesia passengers a more pleasant travel experience and facilitate other SkyTeam airline members through enhanced integrated transfers and airport services, together with improved and expanded premium facilities. Spurred on by a strong commitment to deliver the best service, Garuda Indonesia's performance gradually earned global recognition. In 2010, Garuda Indonesia became a 4-star airline and was voted "The World's Most Improved Airline" by London-based Skytrax, and "Airline Turn Around of The Year" by the the Centre for Asia Pacific Airlines (CAPA), an independent institution for aviation and airline analysis based in Sydney, Australia. Further in 2012, Garuda Indonesia won "The Best International Airline" from Roy Morgan research agency in Australia, and was named "The World's Best Regional Airline" and "The Best Regional Airline in Asia" by Skytrax, during the Farnborough Air Show. Meanwhile, during the Paris Air Show in June 2013, Garuda Indonesia received the "The World's Best Economy Class" award and was ranked as one of "The World's Top 10 Airlines". In addition, during the "Farnborough Airshow" in UK on July 15, 2014 Garuda Indonesia once again received international recognition, winning "The World's Best Cabin Crew 2014" award from Skytrax, beating other nominees, the likes of Singapore Airlines and Cathay Pacific Airways. In 2014, Garuda Indonesia was named one of "The World's Top 10 Airlines" and was ranked seventh in the world, climbing from eight position in the previous year. Garuda Indonesia was also voted "Best in Region: Asia and Australasia" for two consecutive years (2013 and 2014) by the "Airline Passenger Experience Association (APEX)", an association of businesses and professionals that that create, deliver, and manage the airline passenger experience headquartered in New York, USA during the 'Passenger Choice Award 2013' and 'Passenger Choice Award 2014' held in Anaheim, California, USA. Since becoming a member of the global SkyTeam alliance in March 2014, Garuda Indonesia along with 19 other SkyTeam members serves a total of 1,052 flights to various destination cities in 177 countries, and offer a global network that covers more than 16,323 flights daily. In addition, Garuda Indonesia passengers will be able to enjoy 516 lounges of SkyTeam members worldwide.